Looking upwards .. what do I see ? Just the most amazing sky art there can be! Saturday .. a few days ago .. was a magnificently beautiful day and the skies were just plain awesome. I’d accompanied DH to the lumber store and while he selected the supplies that he needed for a project, I wandered outside .. and devoted some time in admiring the show high above me. We all have fun seeing shapes in the clouds and sometimes they are clearly seen. In this one, I can see someone riding a horse .. galloping away to a place in the sky .. Same sky .. another area .. wispy waves that look like a sand washed beach ..
Dreamy wispy clouds that look like the softest of cotton candy floss .. I caught some tree branches in this photo but it shows that fall is near, leaves have begun to fall .. are the branches waving to the sky? Perhaps. Are these two clouds lusting after each other? They seem to be kissing. Lovely, against a panoramic background of incredibly beautiful sky art. Love seeing such a variety of shapes and textures up above .. and I love even better being up there, flying amongst them. Now I can see something above the upper half of this photo .. is it a spreading tree, branches flung far and wide? Is it a mythical shape from Aesop’s fables? The cumulus clouds were so solidly dense it seemed as if I could just reach up and break off a piece .. like a marshmallow or something like that. And, ahem .. are these more amorous clouds that I see??? The clouds are getting a bit darker in some areas .. an indication that rain will be happening later on .. and there was a little bit of rain but not that much really. Art Nouveau, anyone? Time to return home, vehicle loaded with supplies. Camera loaded up with more beautiful photos of the uplifting skies above. The beauty of the skies has a special energy which I find quite compelling. Such random beauty that is ever changing and brightens up our daylight hours. I am compelled to look upwards and sometimes must remind myself to focus on where I am as it is easy to trip over something! At this stage of my life I am no longer embarrassed to be looking upwards and quite often I just simply stand still in awe of the beauty up there. And there is lots of action up there also .. soon it will be time for the Turkey Vultures to migrate and luckily we are on their pathway so I must keep looking up to see this feat of nature. The magic of seeing these birds, many hundreds of them, is humbling. They are part of the nature that created this earth and we mere humans must always respect this. Despite all the inventions by humans, the raw power of nature answers to no one. Thank goodness for that, eh??? I have to say this … we Canadians are well known for saying “eh” … and that is not a bad thing. And there are a few thoughts on how this came about. My vote is for the French “hein” meaning “what”? Some words in French, carried over to English, are pronounced without the “h” sound. thus “hein” becomes “eh”. And there are other words carried over also, which need the “h” sound, but that is for another day, another blog. Categories: Gardening, Positivity | Tags: art nouveau, Beauty, blue skies, clouds, hein, magic, migrate, random beauty, Turkey Vulture | Permalink. Life is just a busy fun place to be and sometimes I speed up when I really should slow down. And that is where friends come in! I have been busy working on the little garden at the Dakota Cafe for the past 3 mornings. One day spent weeding and digging through the plants with my pal D to help me out. The next day was intensive weeding and planting. And this morning, a frenzied time of cutting back Rex Rosemary which had grown to be too high for the windows of the cafe .. it was getting difficult for customers to spot planes through the windows.. so a massive cutback was done (sob). 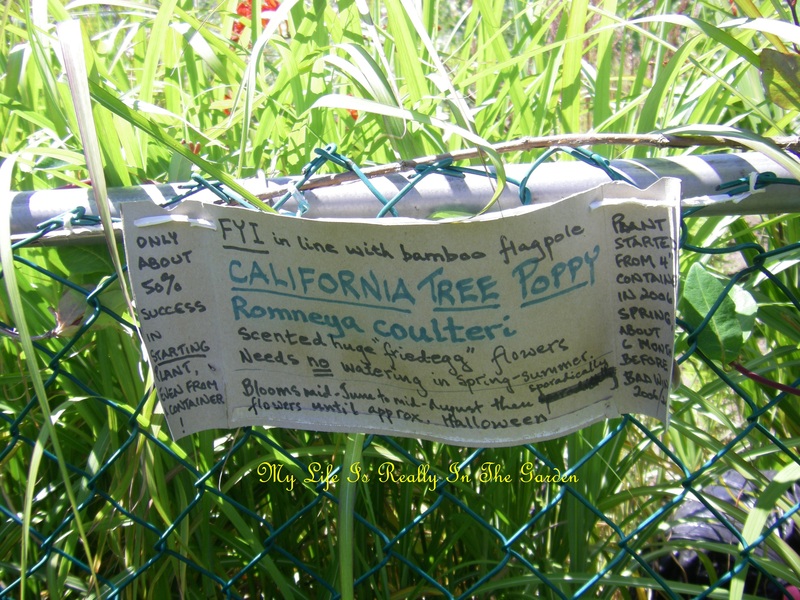 I’ve taken most of the cuttings home and will try to propagate them. No photos really, but once the little flowers start blooming, I’ll be clicking away. It sure felt good to work intensively for 3 hours or so at a time … and I was spoiled and given tea by lovely Jess .. so I happily drank my tea and gazed upwards at the blue skies. Lots of planes, eagles, turkey vultures and other birds. Sheer heaven. Then time for a visit with D and her son … she gave me some great clay pots and I plan to make a crooked planting, arranging them on a section of rebar in the garden. 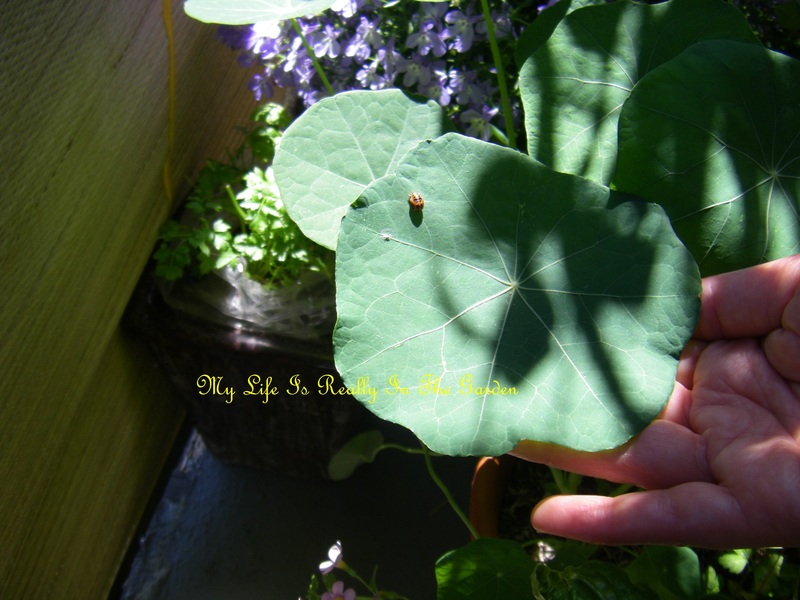 Then she showed me a little ladybird dragon that was morphing into a ladybug on the nasturtium leaf… how very magical! Also, she has a Garry Oak growing in her hop plant ….I forgot to take a photo, but believe me .. it is there and very healthy. How exciting!! Then D wanted me to go to see the amazing boulevards in the Haultain area and here is one that is just spectacular .. I think that the homeowners were advocating boulevard gardens years ago, they were very hardworking. And from the look of their boulevard gardens and their private gardens they haven’t slowed down a bit! Very impressive and inspirational. 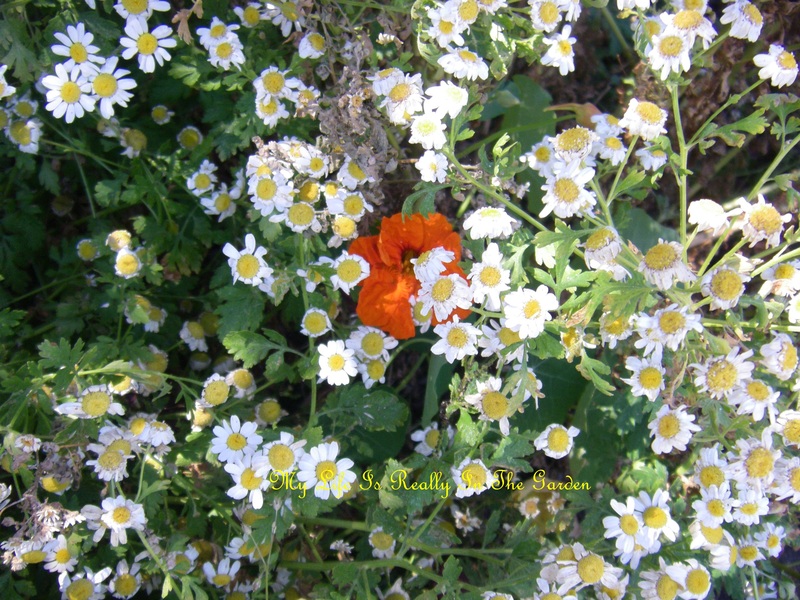 Colourful nasturtium flower peeking out from the feverfew .. 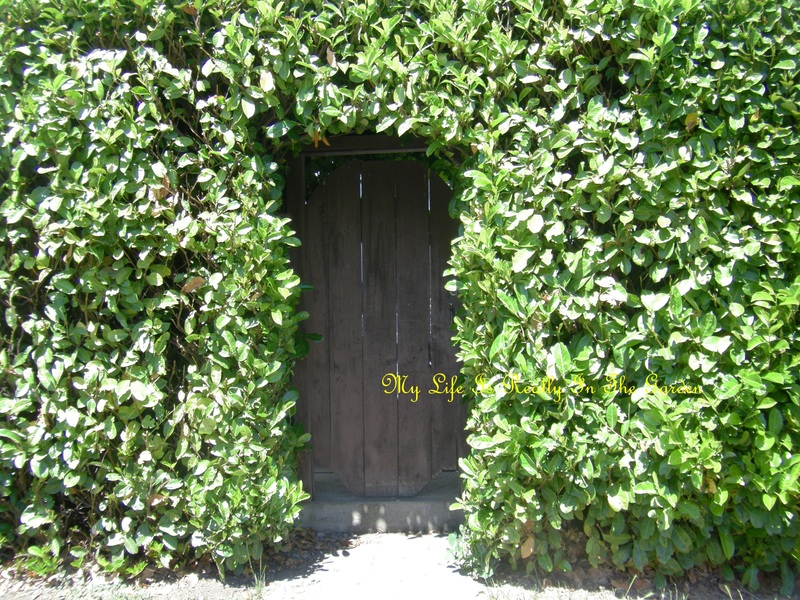 I love this “secret” front door …. well done! 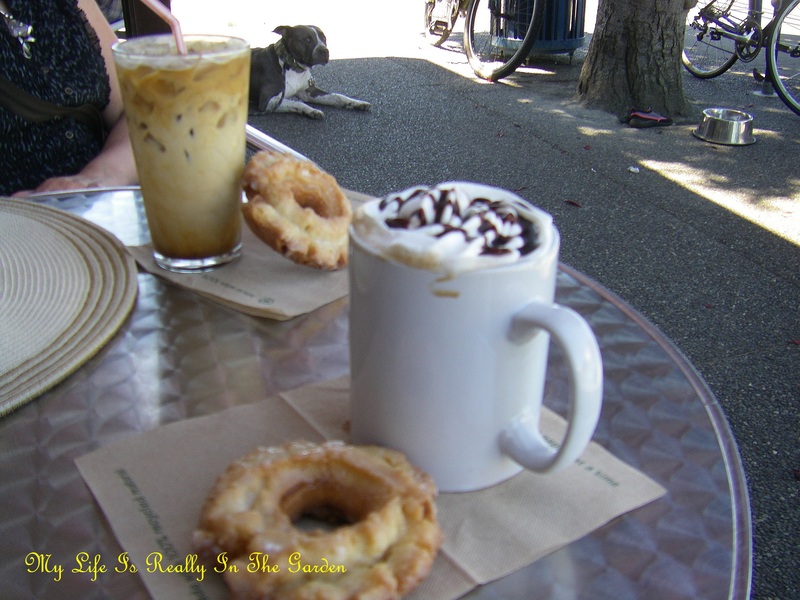 Then it was time for refreshments … at a lovely little table outside the coffee shop … see the darling dog in the background? His doggy parents were making sure he was in the shade, had access to water and he was one happy little guy! 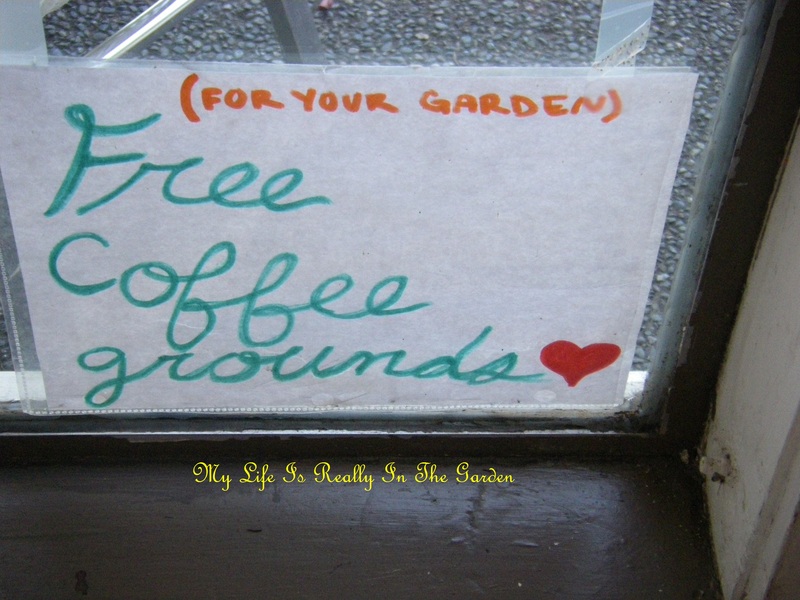 Yea .. coffee grounds for the garden .. happy to see ..
I’m betting that the coffee grounds/compost material doesn’t stay around for long, there are many gardeners in the area so I counted myself very fortunate to have this bag. 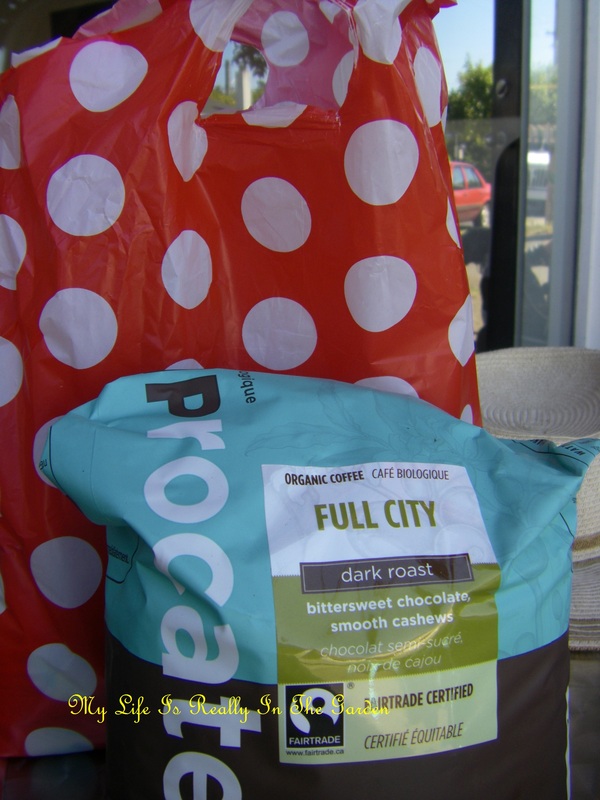 Oh, see the red/white polka dot bag behind this? It’s my special surprise purchase from today. There is so much to see and do here in Victoria .. here are some posters showing some of the activities, music, dance, drumming …. But then I fell in love with this very funky dress .. it is from Italy! The owners of the shop had taken a trip there and brought back some clothes to sell. Not sure if this photo does the dress justice, but this dress is me! It’s raggedy, swirling, colourful and I love the uneven hem. See the round circles on the front, showing the colourful fabric beneath . .these aren’t pockets, just design circles. This is my new sunshine dress and I plan to wear it a lot this summer! I’ve been looking for a nifty dress and so happy now I found it! This wouldn’t have happened if I hadn’t gone for this walk with D!!! I can’t imagine not having this lovely fun item of clothing! 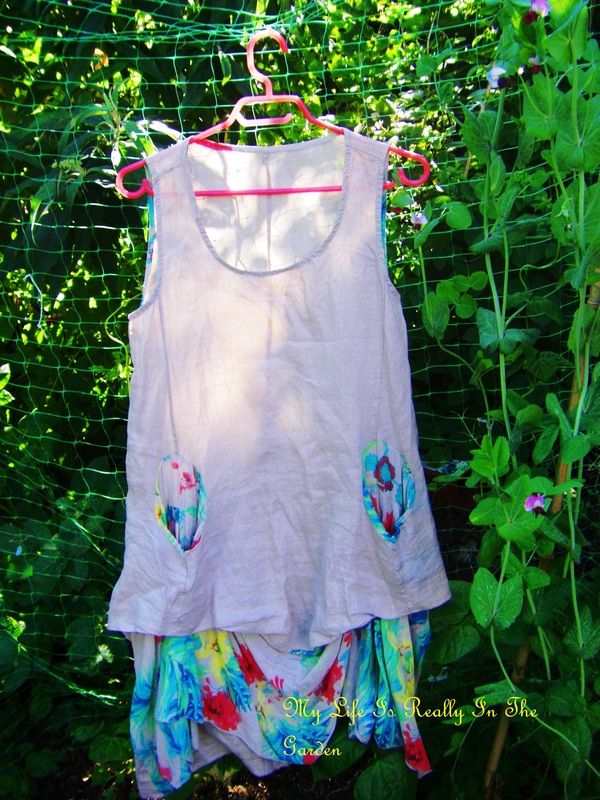 See the pea flowers along the right of the dress … they match! 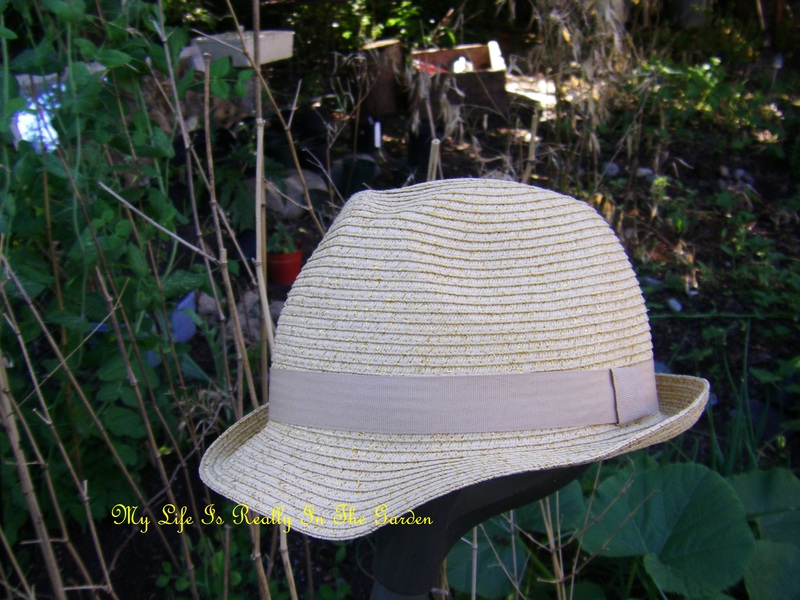 And here is my sparkly hat (gold threads woven through that just shine in the sun! ): So now I am all set for the summer! 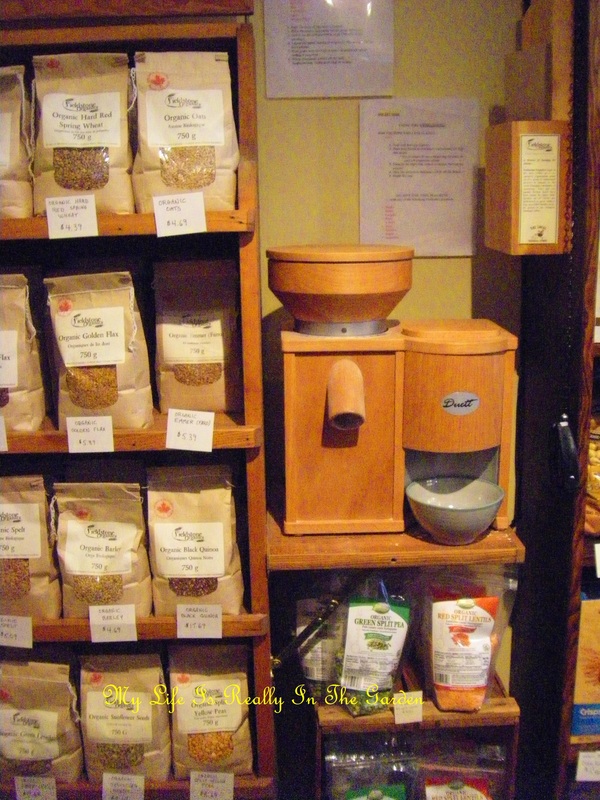 Then it was time to check out a lovely new little grocery shop and they have a machine that will grind up grains …. well done. 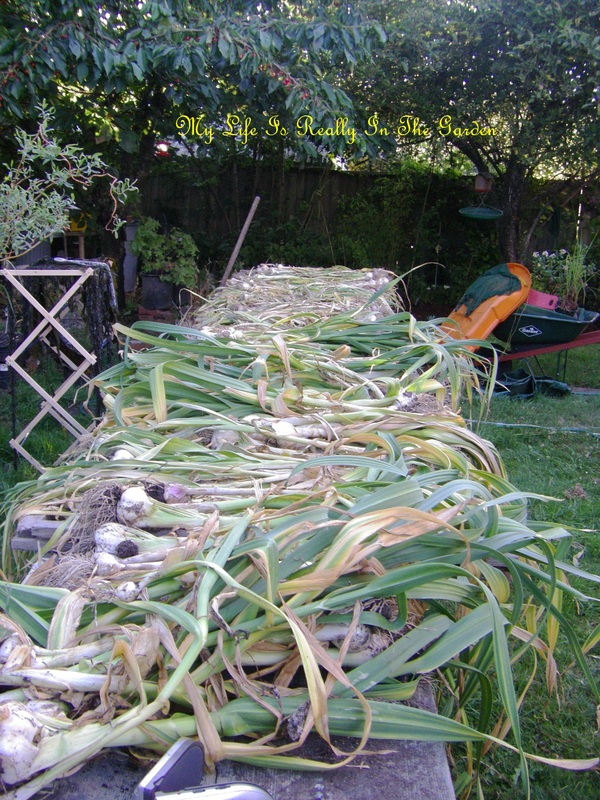 Back at home, there was just a little more garlic to harvest. Time passes so quickly, it just seems like yesterday when I was planting the cloves in October. Now we have gone full circle. 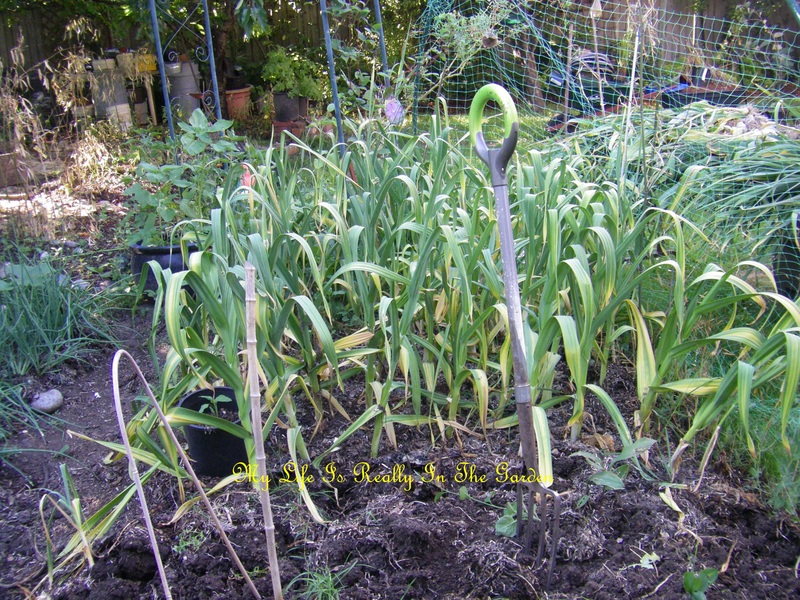 The garlic is now outside, curing in the sunshine .. and I plan to try to braid the soft necked garlic. Well, it’s been a busy day. D and I parted ways .. I went shopping for groceries and beer .. promised myself a wee glass of wine when I got home! And now I must go outside to see if the sage cuttings (from Dakota) are doing well and to put them in a bucket of water .. tomorrow I will taking cuttings of them, the Rex Rosemary and some Wormwood cuttings also. Also, lately I’ve been buying more plants. I know, I promised months ago that I wouldn’t and I have not yet kept that promise. However, a few days ago, when D and I were returning from gardening at the Dakota Cafe .. the traffic was quite heavy on the highway. So she suggested that it might be a good time to turn left and go visit the Art Knapp garden centre at Mattick’s Farm. What the hey, I thought, so my car dutifully turned left and .. drum roll … once again I did not keep my plant promise. Due to the heat .. there were a lot of plants for sale. I should mention that we’ve been undergoing a heat wave and plants are just going crazy. Anyway, there were a lot of deals and I bought all sorts of veggies, 3 different squash plants, a tomato, and many others. Besides some interesting berries, a purple raspberry and I just can’t remember the others. Oh, red onion sets, white onions, a dill .. countless others. They have been soaking in EM and water since yesterday and tomorrow I can plant them in the areas now vacated by the garlic. 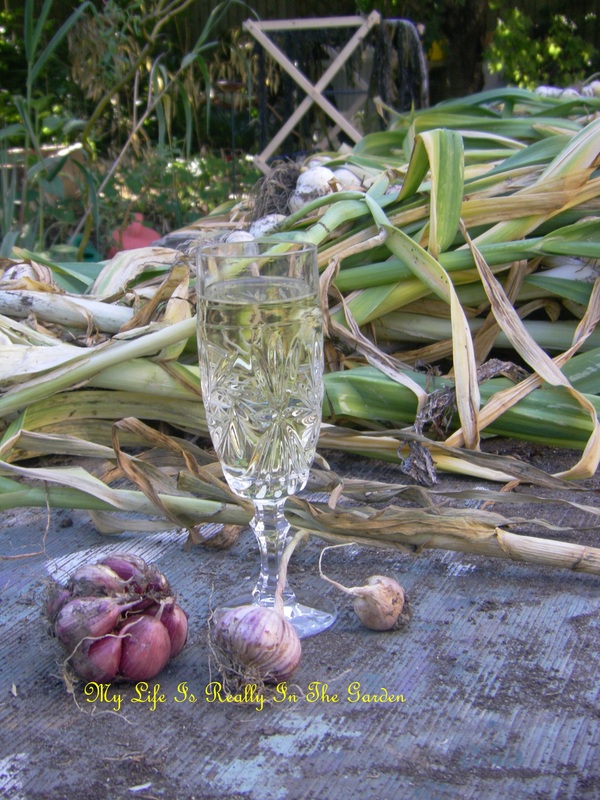 Speaking of which, I harvested the last of the garlic .. kind of a nostalgic moment .. and it was a very satisfying feeling to think back to last fall, culling the largest cloves for planting. Then the process of preparing the beds, planting them. Covering with the seaweed that D helped me collect last summer. And then I watered with EM at various times. Well .. it’s been a day .. just really wanted to share my fantastic dress, really, I just love it! 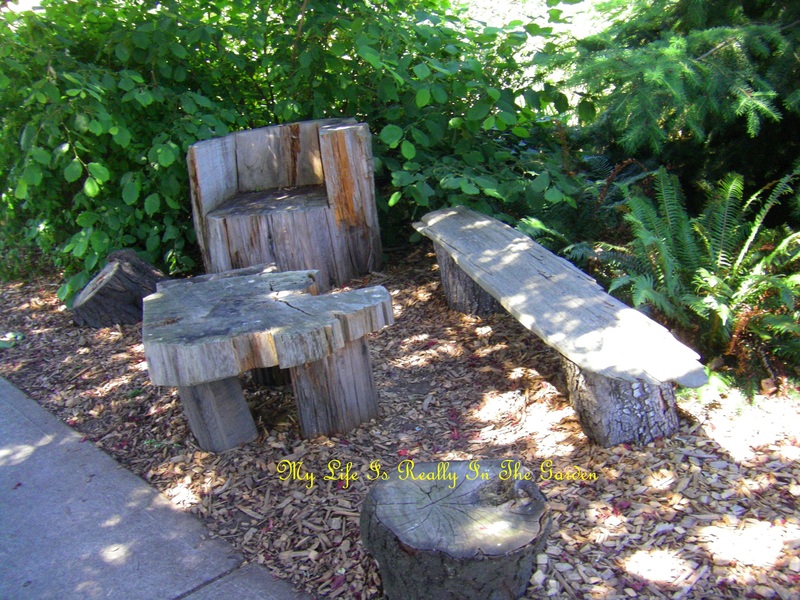 Categories: Gardening | Tags: Beauty, Garden, Garry Oak, Home, nature, outdoors, Plant, plants, Quercus garryana, style, Weed, Weed control | Permalink. It’s been a busy week in my life thus far .. and I’ve gone back to making soap! No photos today … but I will try to paint some pictures with words today! I’m a multi-tasker .. as are most women. Why do just one thing when I can wear myself out doing four or five? I fully intended to do just this one thing. Then, decided to go back inside the house to get some bird seeds for the feeders. And here is where it started. Might as well take care of the laundry while I was inside. So I emptied the dryer and filled the washer. Then, well, might as well heat up a quick cup of tea. The compost bucket was full, so outside it went. Soon I was outside, enjoying the warmth of the cup of Yorkshire Tea. Next, over to the compost bins .. emptied veggie & coffee material to the compost. Added seaweed, layer of cardboard, sprinkle of glacial rock powder and some EM. This is going to be awesome compost. Next, check the hummingbird feeder. Topped up the bird seed stations. Began picking up more of the hundreds of apples that had fallen from the tree. Finally .. the time came to move the new plant purchases. Two more of the lovely spring-flowering evergreens, a winter flowering pink currant (for the hummingbirds and some ground covers. I know … I know .. a month or so ago I promised myself that I wouldn’t weaken and would not buy any more plants. Well .. I only bought these yesterday … because I happened to go downtown and just wanted to make a quick visit to Capital Iron. And I thought, well, if it’s meant to be … meaning, if there were any more of those trees left there in the lower lot (half price!!!) then I’d purchase them. And you know what! There were two of them left! So I took this as a sign and soon I was loading my new purchases into my car .. after paying for them, of course. When there is a plant sale on, I can justify every single purpose. So, that is my most recent plant story. By now, after all my running back and forth it was late afternoon and the skies were slowly darkening. So I spent some time chopping up my oak leaves for mulch. Soon, dusk had seriously descended and it was to hard to see what I was working at .. so, begrudgingly I gathered up all my toys and trudged back to the house. But wait, one more thing to do. One of our homework assignments (landscaping course) is to take the measurements of a staircase .. so I grabbed a tape measure, pencil and paper and began this task. The math part of the course has been a struggle for me and for some others in the class also .. so I don’t feel quite so bad. I’ll work my way through .. though. And so very lucky that everyone is so sharing in the class .. makes the struggles more bearable. 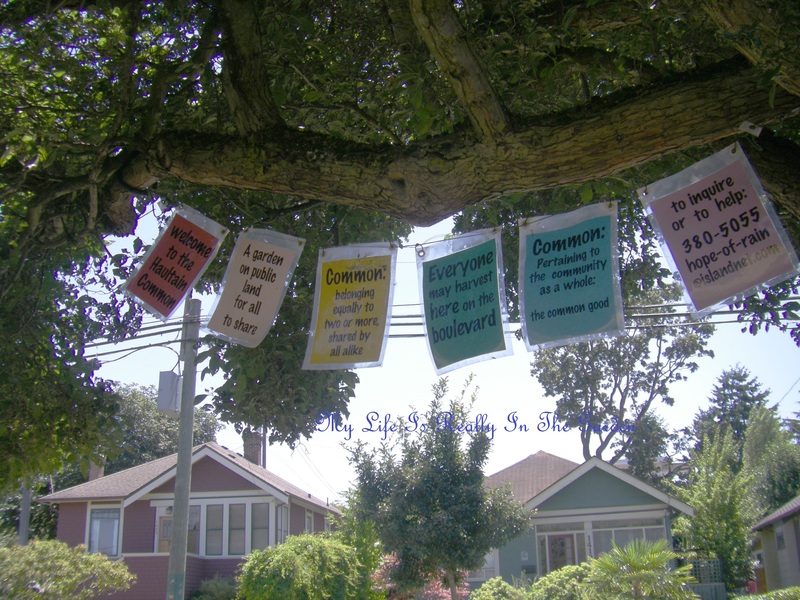 Just as the Organic Master Gardening changed forever the way that I garden, so to will the landscaping course change forever the way that I look at gardens, structures, placement of landscapes and all that. Sigh. Just have to struggle through and I will be ok.
And so .. I’ve been quite busy with all this and other things also. For I have gotten back into soap making! Found some of my notes from 1986, when I was writing out soap recipes! So I’ve been spending evenings mixing up soaps. Playing around with colours (using herbs & flower petals) and some with scents and some without. My good pal D gave me a wonderful gift of dried Calendula petals. She gathered the flowers and carefully dried them. I think it was 5 cups or so of petals were reduced to several cups, once the moisture was removed. And last night I mixed up a soap with these beautiful petals, some ground up orange peel and they look so pretty. I’ll take some pictures later today and will post them. 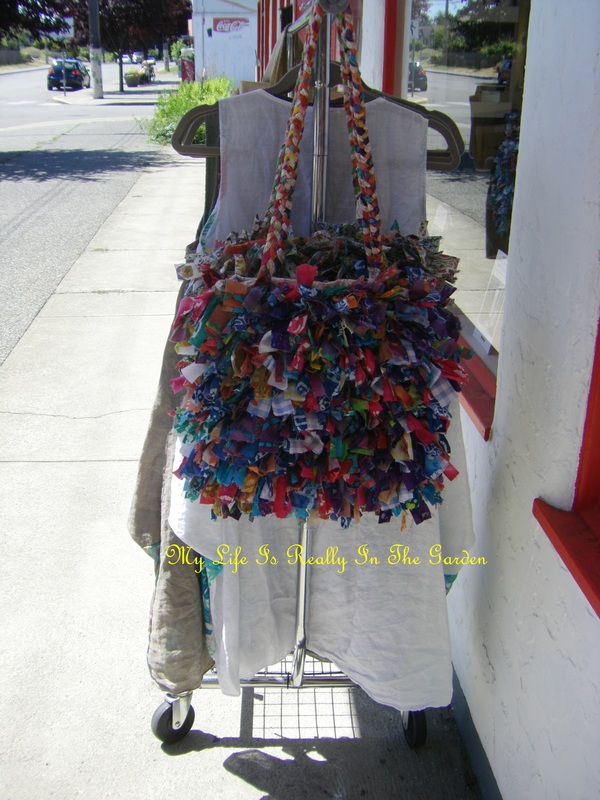 Next will be the packaging of them .. for I am going to try to get a table at a local artisan type of craft show. Fingers crossed I’ll be able to do that. Because I’ve made nearly 30 pounds of soap. Bought the most beautiful fabric to wrap them in. And so my life continues in its little multi-tasking way. And I’ve only listed the highlights of the past week. Yesterday I saw the most beautiful rainbow .. saw it twice actually! 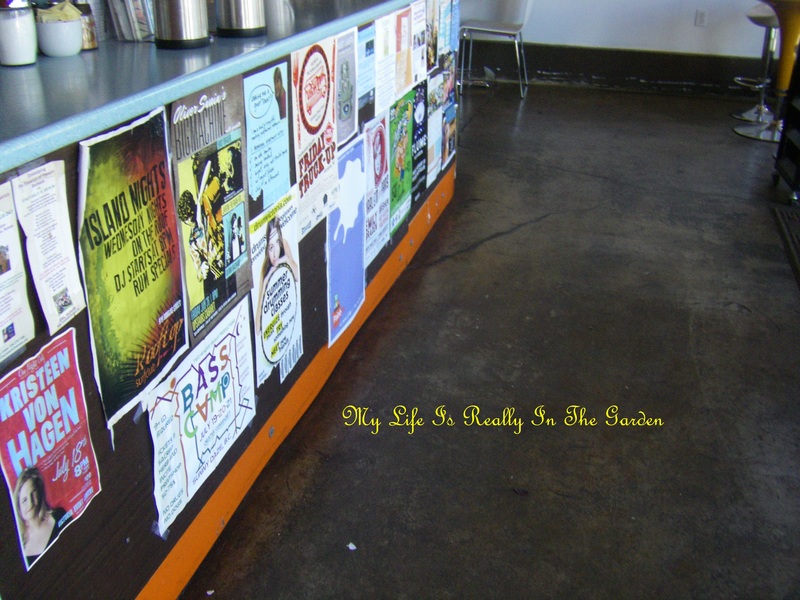 Once when I was downtown (coincidentally, I was on my way to look at the plants on sale!) And another time when I was nearly home. No camera with me .. but happy to see a young guy taking lots of photos. So the beauty was captured, except not by me. Anyway .. on with this day. Shopping to be done. Homework assignments to be completed. Soap to wrap. And all the other daily things that need to be done. But first .. I’m going to spend a few more minutes looking out our kitchen window. Admiring the beauty of the birds that are visiting the feeders and flitting about the trees. The Juncos, the Flickers!! !The Anna Hummingbirds, a few European Starlings, Chickadees, Nuthatches, sparrows and some lovely little songbirds. Yet again I am so very happy that we planted all the trees in our yard, so many years ago. Safe little places for all the birds to settle in and relax and preen themselves. And I’m also rewarded by their songs! 🙂 On with this day. 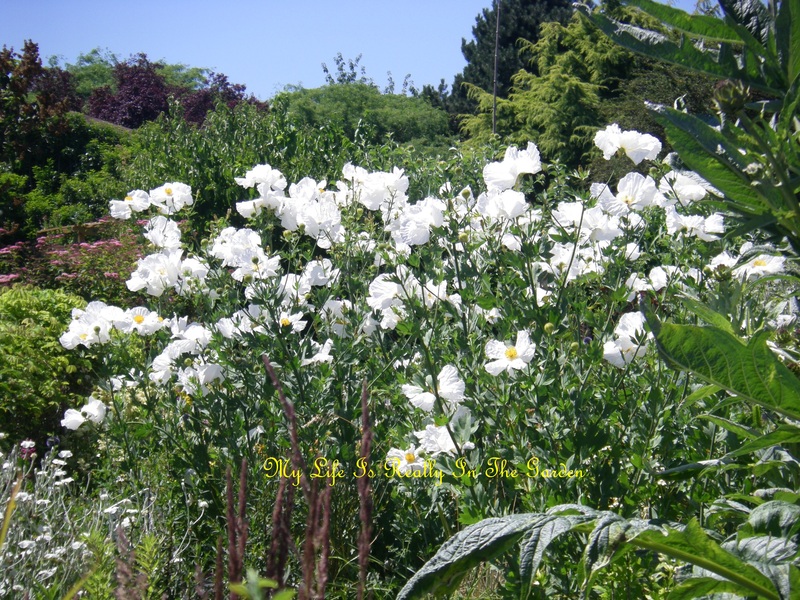 Categories: Gardening | Tags: Beauty, Craft, Petal, Soap | Permalink.